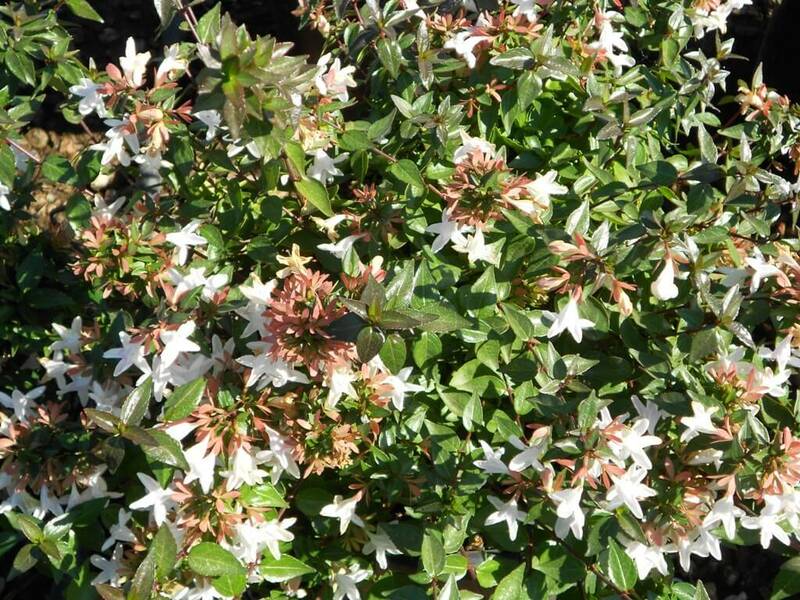 Named for Dr. Clark Abel, an early 19th century British doctor and horticulturalist, Abelia grandiflora ‘Sherwoodii’ is a dwarf variety distinguished by its lovely lavender-pink flowers and manageable size. A mature plant will be 3-4 tall and 5 feet wide and responds well to selective pruning. This is a very satisfying plant, easy-to-grow and evergreen to 15°F. It will be deciduous where temperatures dip below 15°F. The trumpet-shaped flowers appear in profusion most frequently in late spring to summer through fall and leave decorative bronzy sepals well into the autumn months. The new bronze foliage turns glossy green and then often will turn bronze again in the fall. It responds well to selective pruning and loves well-drained soil but tolerates clay and damp soils. It does well where deer are prevalent, in drought conditions, and on the coast. Be prepared for hummingbirds and butterflies to frequent the garden when the flowers are in bloom!